At the beginning of 2018 exploration spend offshore Australia was at its lowest levels since 2004, with only a single wildcat exploration well drilled offshore in 2017 and four offshore in 2018 to date. An energy ‘crisis’ on the east coast of Australia, where domestic gas prices have doubled in the last two years, has been insufficient to stimulate the search for new gas resources in the offshore eastern Australian basins so far. Nevertheless, the seeds for renewed exploration are being sown. Activity is picking up in the Gippsland (Baldfish-1) and Otway Basins offshore southeastern Australia. Exploration drilling activity has resumed in the west, and the 2018 offshore acreage release is wide ranging, and includes several interesting opportunities. The Dorado and Ferrand discoveries in the North West Shelf are particularly welcome against these low levels of reserves replacement. New, independent unconventional exploration in the onshore basins is also emerging as an important potential source of new gas supply for the eastern Australia market. Looking forward, where might the exploration recovery come from? The Gippsland Basin in Bass Strait is historically Australia’s premier oil province. The basin has lain fallow for the last decade or more without systematic exploration outside the heartland of the Central Deep and production licences. 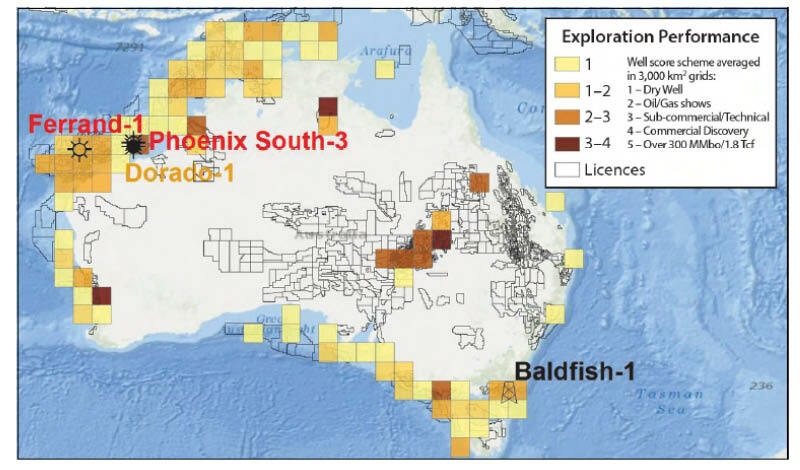 Exploration attention is increasingly turning to the deeper Golden Beach and Emperor subgroups in the basin and moving towards the basin margins. Drilling activity is picking up, with ExxonMobil spudding Baldfish-1, outboard of the Dory gas discovery and Blackback oil field. Development of the Sole gas field is currently being executed by Cooper Energy. The Gippsland could undergo a rebirth and has the potential to turn up a surprise, since it has been overlooked for some time and has a prolific history. Exploration in the Otway Basin is also coming back into focus. This is an area where chasing amplitude anomalies on 3D seismic has been very successful. Three areas have been released for bidding this year and Spectrum is undertaking a basin-wide PSDM and broadband reprocessing of the 3D seismic surveys in the basin. Following on from recent discoveries, exploration drilling by Quadrant/Carnarvon is currently delivering success in the Roebuck Basin on the North West Shelf, with the Phoenix South-3 well intersecting 131m gas. A well on the large Dorado prospect, up-trend from the Roc discovery and relying on lateral seal against a large canyon fill, revealed a total of 132m oil pay in the Triassic, the largest liquids discovery for a long time in this region. The discovery has spurred Santos into making an offer to buy Quadrant. Woodside have added gas reserves (69m pay) north of Gorgon at the Ferrand discovery well, and also in the Carnarvon Basin. A four-well exploration programme is firming up in the Canning to follow up the Ungani success by Buru. In the onshore Perth Basin independent operators are planning at least two wells to further test the Waitsia concept and a follow-up well is being planned for the Xanadu oil prospect. The turnaround is underway in Australia. The eastern Australia gas supply shortfall is providing the impetus for significant unconventional exploration efforts in Queensland and the Northern Territory, and a rebirth of conventional exploration activity in the offshore Gippsland and Otway. Over in the west, new discoveries on the North West Shelf, and follow-up from recent play opening successes are the key drivers for drilling activity, with several key wells being drilled in the next year or two in the offshore Roebuck and the Canning onshore Basins. Altogether 93 applications were received when the APA and 20th licensing rounds were closed in October and November respectively, proving that there is still a strong interest in exploring for oil and gas both in mature and frontier areas offshore Norway.